Facebook has begun to roll out a new mobile feature called Nearby Friends that allows you to share your exact location with friends and receive push notifications when your friends are nearby, the company announced Thursday. Nearby Friends let you choose which of your Facebook friends you’d like to continuously share your precise location with and the length of time you’d like to share. 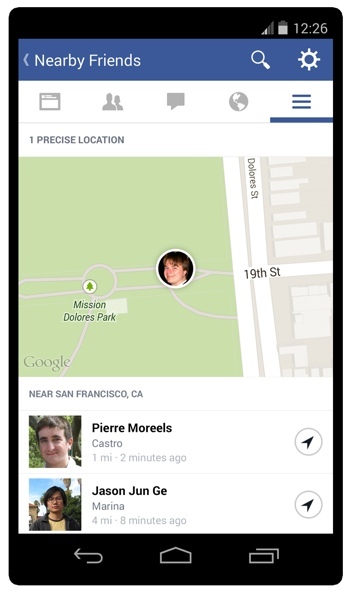 Both you and your friend will need to have Nearby Friends enabled to use the feature. Note that turning on Nearby Friends will also enable Location History, which will allow Facebook to keep data on where you go and when, even when you’re not using the app. You can toggle Location History on and off by tapping More > Nearby Friends > [Cogwheel Icon] > Location Settings. Nearby Friends will be rolling out to iOS and Android users of the Facebook mobile app “over the coming weeks.” For more on Nearby Friends, check out the short promotional video below. For more on managing your data on the social network, read our Comprehensive Guide to Facebook Privacy Settings.